Peter Maas was an American journalist and author born of Dutch and Irish ancestry in New York City, New York State USA on 27 June 1929. He died on 23 August 2001. Maas was educated at the prestigious Duke University in Durham, North Carolina. Much of Maas’s writing featured crime and policing. 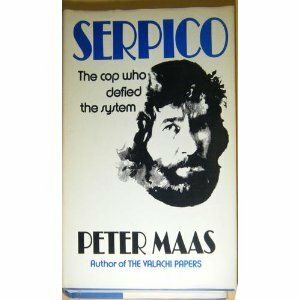 In this book, Serpico, Maas wrote the biography of Frank Serpico who was a New York Police officer who witnessed and testified against corruption in the police service. Various other biographies and autobiographies are included on this site. They include: Sir Alan Sugar https://bookreviewstoday.wordpress.com/2014/06/28/sir-alan-sugar…charlie-burden/, As Far As My Feet Will Carry Me https://bookreviewstoday.wordpress.com/2013/03/29/as-far-as-my-f…-james-m-bauer/, Wasted https://bookreviewstoday.wordpress.com/2013/05/17/wasted-by-mark-johnson/, Humble Pie https://bookreviewstoday.wordpress.com/2013/06/14/humble-pie-by-gordon-ramsay/. When my mother was moving to a retirement apartment, she decided to off load many of her books. I picked up a few books from the pile that she was getting rid of and Serpico was one of them. I remember the Al Pacino movie from years ago and though the book might be an interesting read. Time went by and it was years before I finally got around to reading it! However, this is a story worth reading. It is set in the late sixties which was a time of great social and political upheaval. At this time, also, corruption was rife within NYPD. Frank Serpico was an officer in NYPD. He was a working class cop from Brooklyn born into an Italian American family. He had long hair, a beard: Serpico was an unlikely fan of ballet and opera. When he witnessed corruption amongst his colleagues he would not be silenced and could not be bought. The story was a real eye opener. A culture of corruption had pervaded the New York City Police Department for many years. There were payoffs to the police. Members of the force took cuts from gambling rackets, drug dealers and illegal protection schemes. They were common practices. There was a bluecode of silence which protected the crooked cops from sanction. Even today, many members of the police forces across the world are despised due to the prejudice and corruption they pedal. It must be awful for those who go into the job who are good and decent. I did a little research recently, after reading this book, it really does not seem like much has changed since the sixties. We need more people like Frank Serpico in this world. I found this a very interesting book. It may have been written many years ago, but it has a resonance for today too.